Yulio Chief Product Officer Ian Hall recently attended VRX 2018 and brought back some key VR trends and winning patterns from the conference. While we’ve expanded on them a bit below, the overwhelming theme is that VR adoption is being led by business adoption and not consumers. As we’ve predicted, waiting for consumer VR headset sales is the wrong adoption indicator – and will leave you flat-footed when it comes to sharing your vision in VR. 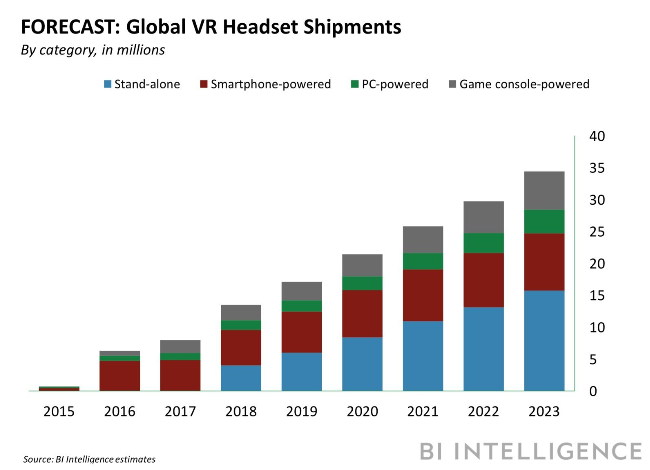 There have been a number of analyst predictions around headset adoption, which consistently indicated that beginning in 2018 and through 2020 standalone headsets like Oculus Go, HTC Vive Focus etc. will dominate over a console or premium mobile headsets like Samsung’s Gear VR. The Oculus Go has been a game changer in the area, removing much of the friction we’ve seen for our clients of awkwardly trying to put their phone inside a headset etc. Look for the Microsoft Hololens and continue innovation from Oculus to lead in this area, with shipments expected to double between now and 2020. Like our Yulio Clients, Perkins+Will noted during their panel at the conference that Oculus Go is a slam dunk, and that their sales team love it. We bet they love it because it removes so much friction from installing an app on your phone, putting your phone in a headset etc. etc. You can get Oculus Go from any electronics retailer, or right from the Oculus store – download our Yulio app and you’ll be all set. Removing friction is the most important of the VR trends, as we’ve learned from our 1000+ hours of user testing. We’ve looked at a number of verticals using VR successfully, and we’ve always agreed with the comment made by Iffat Mai of Perkins + Will architecture -that “VR ROI (in architecture) is a no-brainer, our job is to sell you something that doesn’t exist”. But the opportunities in some other sectors are interesting too. Showrooms and Retail sectors are slightly ahead of A&D in terms of demand, with the major players all figuring out how to use digital reality to create meaningful retail experiences. Beyond retail and architecture, experts see significant potential in Education and Healthcare – but both are challenging to services due to extensive regulation and barriers to changing the current process (whether rolling out a new curriculum in education or extensive health testing). Likely the biggest ‘bet’ will be in the training field, with experiential learning, fewer physical meetings, and more self-guided learning all being keys to the value of VR. Our clients who work in commercial furniture have found that early adoption of VR has allowed them to differentiate from their competitors by offering an immersive experience. Moreover, the experience helps people make faster decisions with a better sense of size and scale – and gives clients the tools they need to ‘sell’ upward in their organizations and achieve final sign off. Read more in our client showcase with HBI in Calgary. The most important VR trends aren’t about technology or complicated gadgets – they’re about storytelling. We recommend to all our clients who are looking to get started that they pick a target project – a pitch or presentation that’s upcoming, and use it as an area of focus to implement VR. One Oculus Go headset and a few software seats on Yulio will have you up and running for your presentation in no time. The key is to quit waiting for perfection….but rather to pick something simple and start your learning process. Our advice? Don’t be alarmed. Fortunately, it’s not too late to get in on the VR game. It is, however, high time to get started. For the perfect way to get yourself up to speed on VR trends, try our Yulio 5-day course and wow your colleagues with this pre-packed presentation full of our VR research on the state of the industry.